You may imagine the excitement of a writer (any writer) whe she/he releases a new book. Most of them don’t show it – probably because they are shy, or they prefer to hide their emotions – but the excitement is there. Long time ago I chose to share all my emotions, regardless the circumstances – love, enthusiasm, fear – so I can live my life fully. It was a decision that I never regret. And that is present in all my writings. And when 2011 knocked the door, I thought: “the next months will be very interesting, as my new title will be released worldwide”. Bingo! What I did not expect (even if I wished and dreamt about it) was to see what I saw. 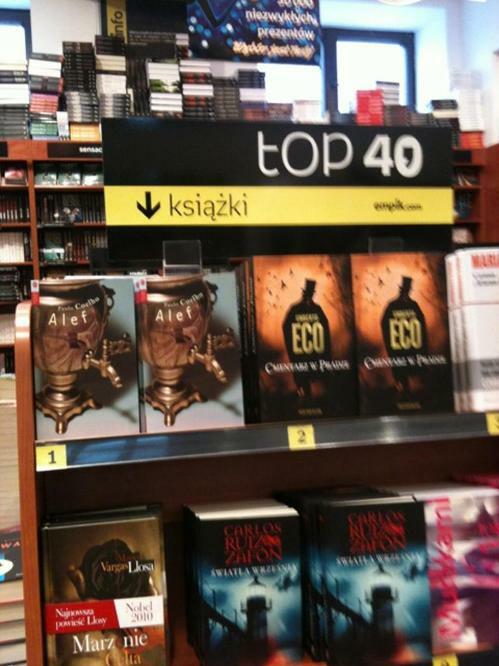 ALEPH made the bestseller lists in all countries it was published (except one). Bear in mind that I decided not to give more than 10 interviews during the year, and the success of the book is basically the word-of-mouth and the social communities. The photo above was taken in the most important Polish chain (Empik). Poland was the final country in 2011 where ALEPH was released. Therefore, thank you for your continuous suppport, your friendship, and your commitment. Thank you, obrigado, gracias, merci!